Last month, I treated myself to dinner at Grace, an upscale restaurant in Memphis' Cooper-Young neighborhood. My dining experience was a very memorable one for the meal was great and the service was outstanding. For my appetizer, I had the baked grits that were the best I've ever had. The combination of stone ground grits, Shiitake mushrooms and Beurre Moutarde Dijon is brilliant. It tasted so good that I wish I had a double helping of it and made it my main course. To accompany my appetizer, as well as the main course, I was served slices of bread that I believe was baked by the restaurant. The bread complimented the grits nicely, completing the best "appetizer" that I've had in a long time. Before I comment on my main course, I want to commend the staff at Grace for being very hospitable and helpful to my dining experience. From the time I walked in the door (by the way, it is highly recommended that reservations be made prior to going there; I didn't but got lucky anyway), I was treated like a VIP. In being served, I pretty much had two waiters serving me, with a primary server and another who was a "floater" who made sure I had plenty of bread and kept my glass of mineral water full. In addition to them, one of the managers (possibly the owner, Ben Vaughn; not sure) also checked on me and even suggested that for my wine, I should get the muscadet. To prove his point, he comped me with a glass that I had with my grits, and he was absolutely right. 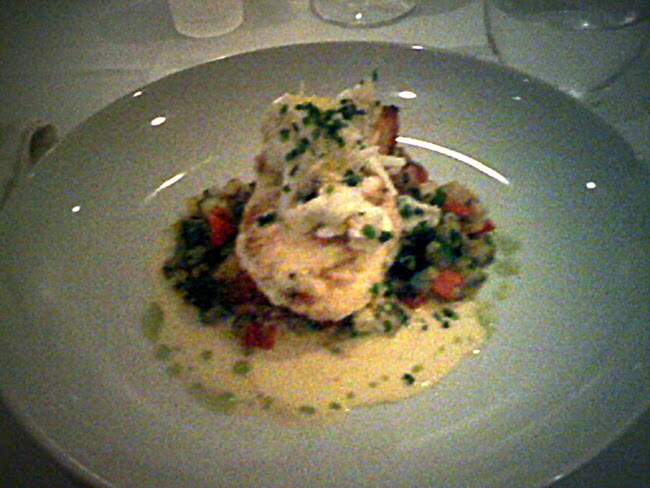 However, I regretably went with a cheaper wine for my main course, the halibut. Sometimes, it's better to go with a restaurant's wine recommendations for their menu offerings that are tailored to complement each other. Overall, I was very satisfied with the service, so much so that I would recommend Grace even if my meal was so-so, which it wasn't. As mentioned earlier, I had the halibut for my main course, and although it was pretty good, it didn 't match the level of satisfaction of the grits I had earlier. Even with the Tasso ham mousseline, Yukon potatoes and the foie gras, I would rate the entée a seven on a scale of one to ten. However, if I had gone with the muscadet, the meal might have been better, so I'll give it a second chance the next time I go to Grace. In summary, my experience at Grace was the best I've had in dining in a long time. Just on the service alone, I would give it high marks, but the meal itself was great and I look forward to going there again soon.